Panaji, August 7: Goa’s first ever taxi-app ‘Goamiles’, developed by Goa Tourism Development Corporation (GTDC) was launched on Monday. In all 350 taxis are on board to provide a convenient mode of transport to citizens and tourists. This is also the first government-initiated radio taxi service in India, which comes at zero cost to the government. 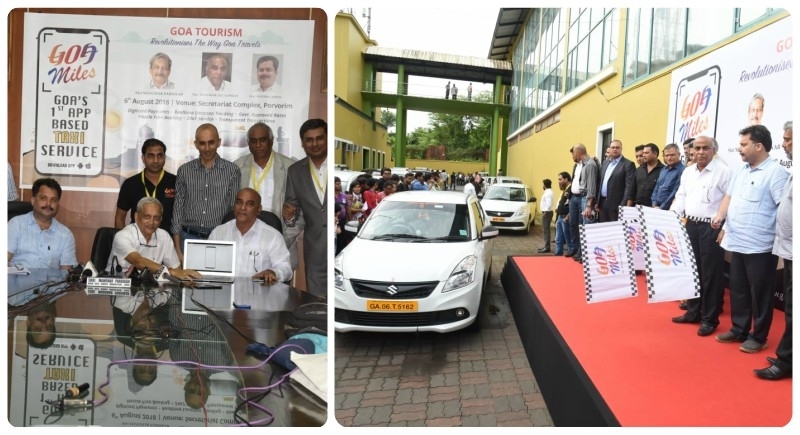 The app, managed by local Goan Company FROTAMILES Pvt Ltd, was launched by Chief Minister Manohar Parrikar and Tourism Minister Manohar Azgaonkar, amidst opposition from the tourist taxi operators. The app, which has reported over 6000 downloads, has already garnered the interest of 3000 odd licensed taxi operators. However, being a new initiative, only 350 have been taken on board in the first phase. Speaking at the launch, CM Parrikar said that Goa can now take tourists for miles through the new app-based taxi service which will be affordable and give travelers a comfortable journey from the time they arrive till they leave. “The app has the potential to multiply the business two-three times, thus increasing the income of taxi operators,” Parrikar said. The Chief Minister said the app will ensure that there is no cheating on fare charges as it is fitted with GPS. “I call upon the taxi operators to be part of this app in large number as GTDC charges will be recovered from consumers and drivers will get their full fare,” he explained. GTDC has set certain do’s and don’ts for drivers like the compulsory uniform, no drink, and drive, safe drive, etc, which will be monitored. GTDC will maintain random checks and balances physically and digitally if required the defaulter will be reprimanded. And also Goa Miles has opened an option for those who want to be drivers in this service as they will provide Luxury cars, no fee for the application, weekly payment, and fixed price.